The Sacramento River passes alongside the Sacramento River Trail. The Sacramento River is California’s longest and largest river. 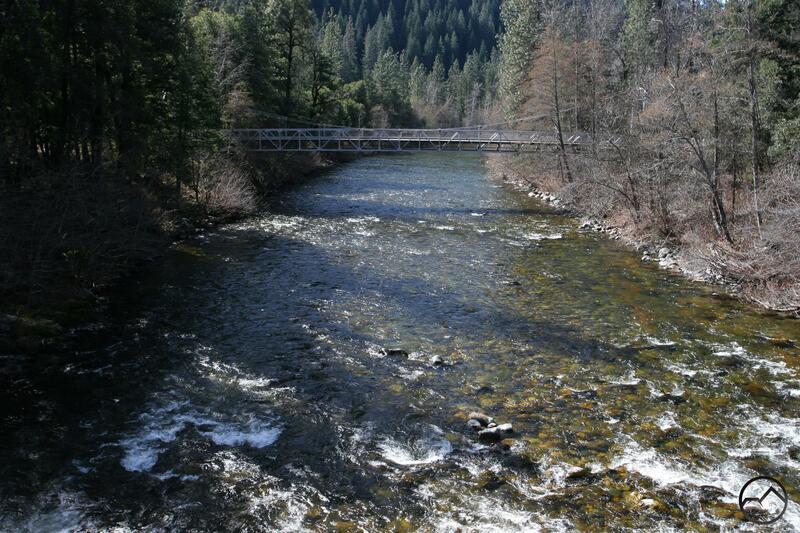 Even though it collects a substantial amount of water from the Sierra Nevada by means of several major rivers and innumerable smaller rivers and creeks, it is not a Sierra river itself. Instead it begins high in the Trinity Divide opposite the Strawberry Valley from Mount Shasta. 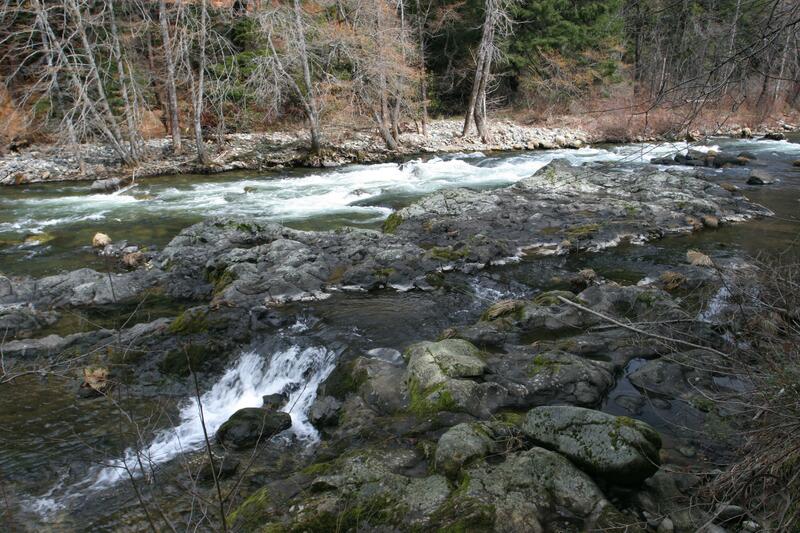 Despite its beginnings at high elevation in the Trinity Divide, the Sacramento River does not spend much time in alpine territory. It quickly races out of the mountains and, after a brief stilling at Lake Siskiyou, it continues its descent down to Shasta Lake. Since most of its length is less than 3,000 feet elevation, the canyon bottom around the river receives considerably less snowfall than the higher regions. This presents an excellent opportunity for hikers during the winter. While the trails on Mount Shasta and in the Trinity Divide are usually smothered in snow the paths that access the Sacramento River are often pleasantly clear. This time in winter and spring is the perfect opportunity for hikers to get out and enjoy the trails that the river has to offer. Mount Shasta peers down onto the Sacramento River. Three trails currently exist along the Sacramento River: the Hedge Creek Falls Trail, the Sacramento River Trail, and the Sims History Trail. None of these trails are long so they are not great options for an all day excursion but what they lack in length they make up for in the numerous interesting features. All three trails provide varying degrees of access to the river and each yields varying perspectives on the nature of the river and its canyon is it flows south toward Shasta Lake. Between the three of them, hikers can enjoy a beautiful waterfall and raucous creek as it flows down into the Sacramento, a swinging bridge over the river and a trailside creek that hugs the riverbank and crosses numerous small creeks, and a path that explores a historic steel bridge and CCC camp and offers the opportunity to scramble over open, rocky banks while the river roars past. 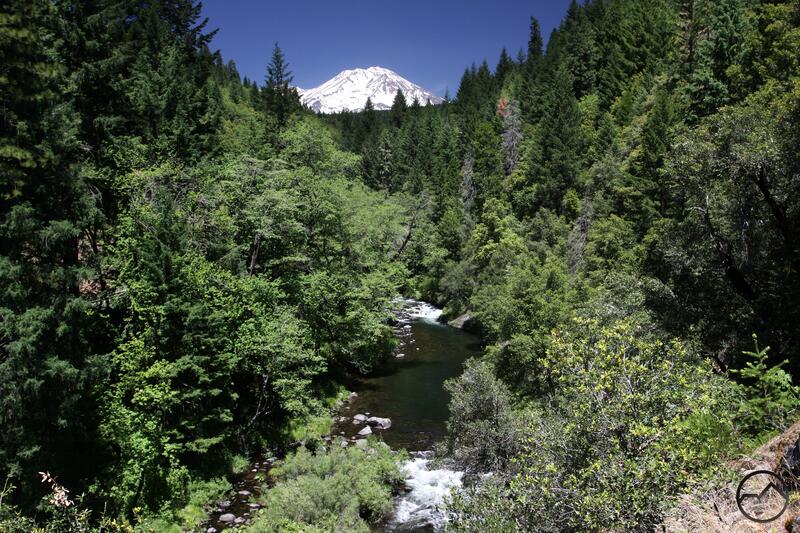 For those needing a mountain fix in the midst of winter, these are all great options to get outside and enjoy the Sacramento River, one of the great features of the Mount Shasta area. Adjacent to and easily accessed off of Interstate 5, the short Hedge Creek Falls Trail seems a world away from the speeding cars and loud trucks on the freeway. It quickly descends down into Hedge Creek’s canyon and the sounds and sights of the interstate disappear immediately. 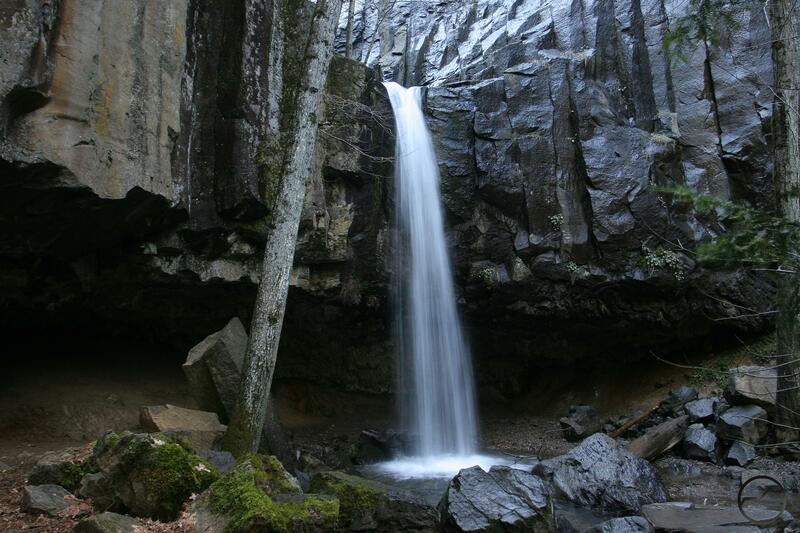 Hikers are left with an easy descent down to Hedge Creek Falls, a beautiful waterfall that spills out of deeply gouged notch in a hanging columnar basal cliff. A highlight of the trail is the routing behind the waterfall, through a cave beneath the columnar basalt. In the coldest depths of winter a gorgeous collection of ice crystals form where the falls crash down into a pool. From the falls the trail continues to descend, this time just above Hedge Creek which proceeds to crash over several smaller but still scenic cataracts. The trail finally at a great vista of Mount Shasta looming high over the Sacramento River as it runs noisily through its deep canyon. For those who want more of the river an unofficial use trail continues down to the confluence of Hedge Creek and the river. Rapids along the Sacramento River Trail. Offering the longest and best exposure to the Sacramento River of any of the three trails that provide access to it, the Sacramento is also the longest trail along the river. Offering a surprising amount of excitement, the trail begins by passing through a narrow tunnel beneath the railroad tracks and then proceeds to cross the Sacramento on a swinging suspension bridge. From there the trail heads east along the bank of the river for about a mile. It starts high above the water but gradually descends until it roughly at the river’s level. Along the way the trail passes several yew and Port Orford cedars, both fairly rare trees that greatly enhance the botanical features of the trail. Once arriving at the river’s level the banks shift from rocky, tree lined banks to exposed bedrock that creates many narrow rapids. Small side channels also form in the naked rock and either produce small cataracts at high water or tidepool-like pockets of water amidst the rugged rock. After crossing several streams, some of which are substantial, the trail finally ends along the river. 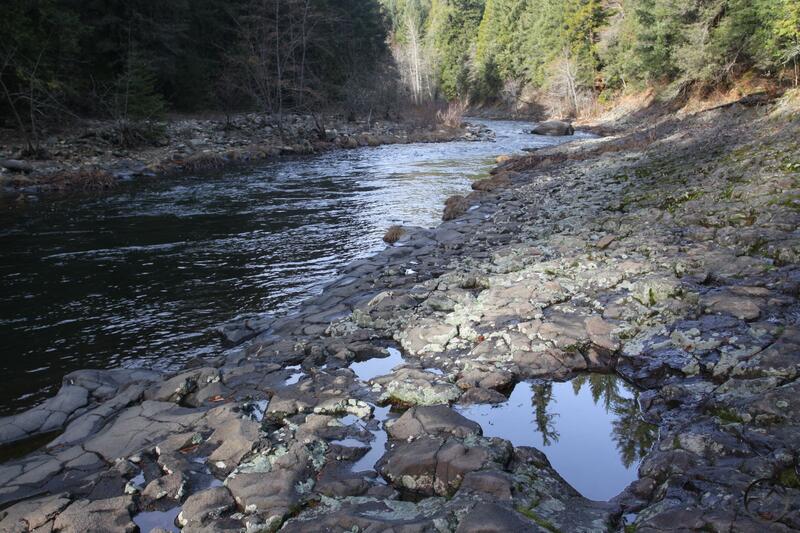 Here there is an off-trail scramble to an unusual set of columnar basalt set above the river. The old bridge crosses the Sacramento River. Not quite out of Mount Shasta’s orbit, the Sims History Trail is a bit far to travel from Mount Shasta just to hike the short trail (unless fishing is involved). Still, for those heading north or south along Interstate 5, it is certainly worth the time to stop and stretch the legs. For those who do stop, the trail offers very scenic opportunity to enjoy both the Sacramento River and significant amount of early 20th century history. The official part of the trail parallels the river for a while before turning inland and passing ruins from a 1930’s era CCC camp. The most notable relic from this time period is the large steel bridge at the trailhead, which can be combined with the modern road bridge to make a short but nice little loop. More ambitious hikers can continue beyond the history trail on a faint use trail that leads to a rocky riverbank where the Sacramento tumbles over some nice rapids. This section of the river beckons hikers to explore further, particularly downstream, where the Sacramento enters a shallow but very rocky little gorge. Thanks for stopping by my blog MyKoruLifestyle.com. I have been looking at all of your trail information and can’t wait to plan a hiking trip to some of these areas.